When we headed down to Escalante this last weekend, it was one of my main goals to try and find this particular pictograph panel. 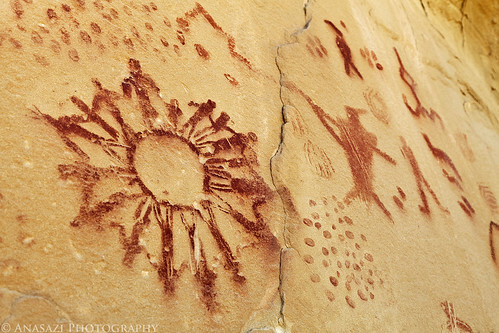 I had seen a photo of this pictograph a while back, and because it was so unique I just new I wanted to find it and see it for myself. I have seen many petroglyphs and pictographs, but nothing like this one before. It’s very interesting that each person around the circle is different from one another…no two are exactly the same. Unfortunately, I have no clue what style this pictograph is, but if I had to guess it would be from a later culture, after the Fremont/Anasazi were gone from this area. Perhaps it is Ute or Paiute? There is a small rainbow off to the right (just out of the frame) so maybe I am wrong and it is Fremont? If anyone out there has some thoughts or information on this pictograph panel, I’d love to hear them in the comments below.